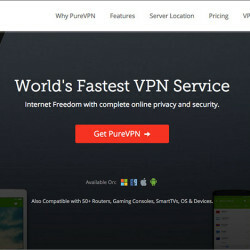 PureVPN is one of the very popular VPN providers with world-wide customers. They have VPN servers in many locations around the world. PureVPN’s main website, purevpn.com, is currently blocked in China. If you want to sign up from China, you might have to first use another VPN service to visit PureVPN’s website, or you can sign up from a country where it’s not blocked. However, once you’ve signed up and downloaded its VPN client, you can use PureVPN’s VPN service from China without further problems.